I really don’t know how best to describe Parque Tierra Santa, I mean where else in the world can you see a resurrection every hour? It is an amusement park with an amazingly unique albeit well-known theme, the life and times of Jesus. Yes, this is a theme park dedicated to Christianity’s most famous protagonist, Christ himself. From the moment you arrive, having bought your ticket from a women wearing a modest head scarf and surrounded by plaster donkeys and oxen, you are constantly inwardly asking yourself: “Is this place for real?” The answer my friends, while a bit outrageous and totally surreal, is a resounding yes. Parque Tierra Santa was built in 2000 as the world’s first religiously themed amusement park. 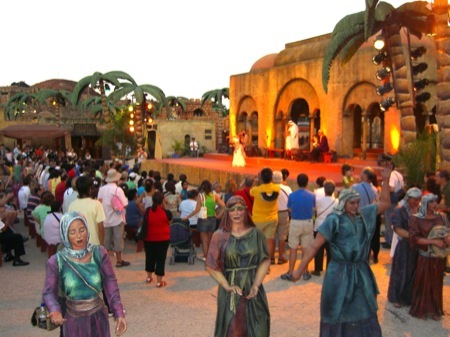 Amid controversy and spectacle the sets were designed, the costumes sewn and the vaguely middle-eastern theme music composed. 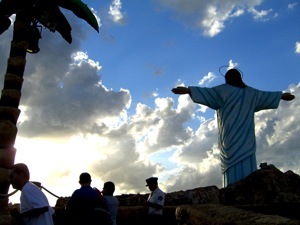 Tierra Santa, literally Holy Land, is now a tourist attraction drawing the religiously pious and the cynically intrigued alike. Boasting all manner of family friendly attractions the park has a variety of shows, live performances, restaurants, shopping and the unavoidable half-hourly resurrection of an 18 meter Christ accompanied by recorded Latin choir singing. The parks attractions are divided into thirty-seven of the main events as told in The Bible. Most of these focus on the life of Jesus, but there are a few introductory phenomenons, such as The creation and Moses freeing the slaves. 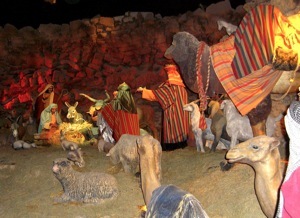 The first main attraction upon entrance is what is billed as the largest Manger in the world, “El Pesebre,” in Spanish. We waited in line for a good fifteen minutes till a Roman soldier got the ok on his walkie-talkie to let the next group in for the show. After a brief saunter through the stucco cave entrance, passing small displays of Christian pre-history, we arrived in the main cavern where we sat with the masses and awaited the show. In the dim light we waited, listening to the quiet choral music and fake bird chirps, till another tired looking Roman announced that the birth of Christ would be delayed a further five minutes due to technical difficulties. I am not making this up; this place is for real. After an underwhelming performance by a mechanical Mary and Joseph, we emerged back into the light just in time for the first resurrection of the day. We climbed Crucifixion Mountain, where a brief trek takes you on a whirlwind tour through the death, burial, and resurrection of Christ. The gruesome theme is a bit diluted by the fact that in the distance is an enormous water park which abuts the theme park and adds a backdrop of water slides to your foreground of crosses and mourning maniquins. Beneath the constructed mountain is an interesting grotto dedicated to various Mary figures from around the world, including Mary who unties the knots, which was a new one for me. Continue through the park and you can admire the various highlights, and the admittedly low points, in Jesus’ life: Jesus pardoning the prostitutes, Jesus healing the sick, the Last Supper. There are also statues and exhibits for some of Christianity’s more modern popular figures, such as Mother Theresa and Pope John Paul II. In an effort at religious freedom the park also has a small Temple and a Mosque, which briefly introduce the two other main Western religions. An artisan walkway sells Tierra Santa memorabilia, clay pots, rosaries, and the ubiquitous Argentine alfajor. As with any theme park worth its salt, Parque Tierra Santa has several restaurants, which follow the general motif of the surroundings. Baghdad café serves up hummus and shwarma, and wine and drinks are available at the Restaurant Armenio. Slightly overpriced, but not outrageous, snacks and sodas are available throughout the park. When the stationary replicas begin to bore, head to the center of the park to catch one of the live shows. A small band accompanies belly dancers and other performers, who shake and shimmy much to the crowds delight. After so many dusty representations, it is nice to see someone with a pulse and a real personality. Tierra Santa is strange, there’s no two ways about it. It is an unusual way to celebrate what most people would consider a solemn subject, and while I personally spent most of the day stifling laughter, it was clear that not everyone had come to be amused. Located on the edge of town past the domestic airport, this one of a kind amusement park is sure to fascinate all visitors. Summer weekends from 4 to 10:30 pm. Winter weekends from 12 to 9 pm. Entry is 15 pesos for adults and 5 for children. Good article. Well written and with a sense of humor. I believe it will save me from a trip to Tierra Santa. This page rendered in 0.557 seconds.